Even if you may not, as I did, have suffered some Great Loss … if you're alive, it's likely that you have experienced adversity and sorrow. Life sure has its way of knocking us off kilter at times! It can be hard, perhaps overwhelming, to find stillness amidst the storms of life, and it can help to be in an environment that helps you re-claim your centre and find your way back to yourself. How? I share my own experiences, and the patterns that emerged in my own journey. These patterns are probably universal. 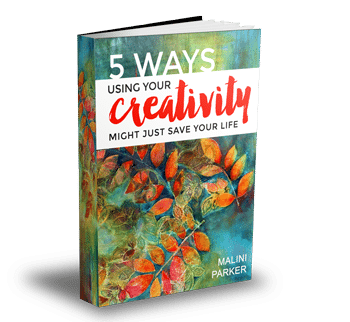 I gently guide you to weave some of those “patterns” into creative activities … and feel the magic of creativity work its way into your heart 🙂 You come away with your own rich tapestry of nine paintings that are unique to you. So, this weekend is not about learning “how to” paint. It is about gently learning about yourself. We will explore our amazing and complex journeys with laughter and a light heart … by making delicious, personal, beautiful art 🙂 And as a special bonus, my lovely friend and yoga teacher, Chioni Hicks, will make a guest appearance, gently helping us to bring balance and peace to our mind and body, no matter what our age, fitness level or experience. Yoga + Art = A Perfect Combination! Sound appealing? Then join me on the banks of the beautiful Swan River in Perth, and be prepared to … gaze out over the Swan River, (we might see dolphins!) get sand between your toes, make art, make new friends, stretch your body and spirit, and take a lovely journey into your life. EMAIL ME if you'd like to go on the waitlist for the next workshop in July 2019. SUPPLIED FOR YOU: Nine wooden panels (each!) to paint on, texture pastes, and a whole VAN-full of supplies! "Imagine... a stunning river setting... an inspiring woman teaching us how to create our own set of 9 paintings... old friends and new... all weaved together with a backdrop of heart-felt tender inspiring stories of finding joy in hardship... a soundtrack of gorgeous jazz & contemporary music... mindful gentle yoga... AND chocolate!! 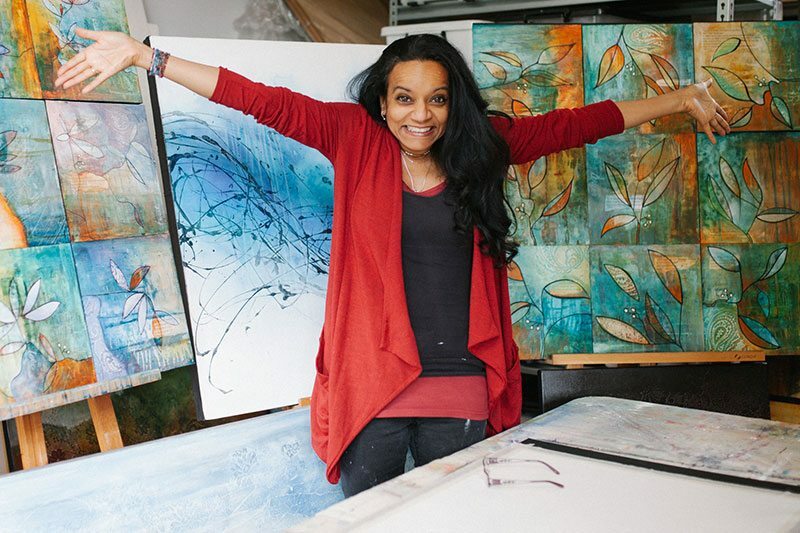 !This was such a delightful & special journey for me to revel and find acceptance in the beauty and tenderness of my inner world...the good, the bad, the ugly...through the process of making the most delicious gorgeous art with the divine Malini Parker. Thank you, thank you, thank you!!! Q. I notice you make a LOT of paintings in one weekend! I’ve never made ANY art before. Will I be out of my depth? A. Many students have never made any art before or come because they feel they had lost their creative or personal mojo. My style of teaching is to welcome anyone who is open to possibilities, and willing to take a chance on themselves. No experience is necessary in ANY of my workshops. Come to FINDING YOUR WAY HOME if you are wanting to use your creativity to help you reflect on your life, to make art that is personal, to think about your unique journey. You will make nine paintings that will surprise you. But if you want a workshop where the focus is on teaching you HOW TO paint – then my one day intensive workshop, PAINTING FOR BEGINNERS would be a better fit. Q. Is this a weekend to talk about grieving? I am happy to engage in a new and different creative experience but not particularly interested in exploring people's grief. A. It's very hard to describe this workshop - it's actually a joyful one, although it could sound like it’s all "about grief" - 'finding the way home' is really just my phrase to mean 'coming home to oneself ' whatever that may mean for you. Most of my students who attend have suffered some setback in life that resulted in a feeling of being "off course". At no point talking about this a requirement EVER, but in the sweetest and most powerful workshops, we do form a safe space to hear about challenges others are facing. Q. I’m a private person and don’t like talking about my feelings. Is there a lot of self-disclosure? A. The amount of self disclosure is varied. Some share, some listen. If it happens, it's minimal and gentle as I don't have qualifications in art therapy and don't claim to. So I don't try to open any Pandora’s boxes! But sometimes making art provides a beautiful channel to very naturally examine our life journey, and this can be shared with others, or not. You WILL hear stories from my own journey, as it places each art or reflection activity into context. And I will encourage you to think about your own lives and have you direct the art you make to reflect what's true for you.